The sequel, which takes place 40 years after the events of the original, sees Jamie Lee Curtis’s Laurie Strode coming face-to-mask once again with terrifying killer Michael Myers. Trouble starts when a bus transferring Myers to a maximum security prison crashes – enabling him to escape, and terrorise Laurie once more. Now, a theory starting to make waves on Reddit suggests Laurie was behind the crash. Warning: spoilers for the 2018 version of Halloween follow. Reddit user underthegod wrote, in a post that has been 90% upvoted: “I believe that Laurie pushed the bus transporting Michael, off the road. “It’s stated several times at the beginning of the film that Michael was being moved from the asylum to a maximum security prison where he would be put away ‘forever’. It adds: “Everyone is probably screaming right now that ‘new Loomis’ was obsessed with Michael and clearly had a hand in crashing the bus, but I don’t think so. “We can see Laurie sitting in her truck downing nips waiting for the bus to leave. The scene ends with what clearly looks to be a hallucination of ‘the shape’ approaching her vehicle. “We then jump to the restaurant where Laurie shows up and is clearly drunk. She appears to break down over embarrassing her family. But I believe this is actually guilt. “She knows that freeing Michael will eventually bring him to her, but he will kill along the way. “The next day Laurie is doing something in her kitchen with a TV playing in the background. The news report lays out how the bus transporting Michael crashed and the patients were found wandering. “Laurie barely flinches at this information! She should be freaking out and running to get her family to safety. “Instead she calmly goes to her daughters house and then is asked to leave after scaring her and her husband. 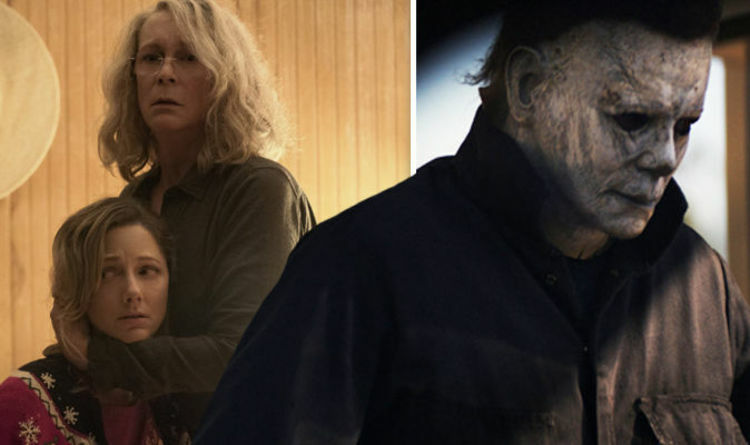 Halloween is set for a huge box office opening, and an end credits moment appeared to hint that a sequel could be made.